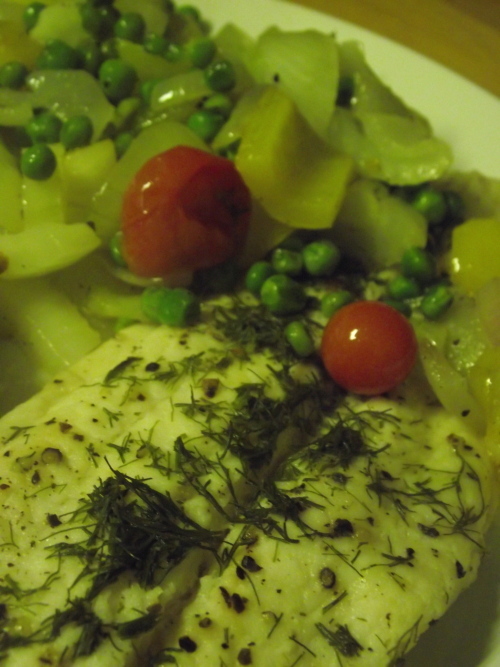 Fennel and white fish are the perfect pairing. Personally, I like fennel with almost anything. It’s easy to find, easy to cook, very inexpensive and very versatile. For the white fish, my preference is usually Basa. It’s commonly available as frozen fillets in many grocery stores. Zest the lemon and chop it finely. Add zest and lemon juice to bowl with garlic and mix well. Rough chop the fennel bulb including the lacy green leaves. Saute the fennel, peppers and onions in oil and butter for 5 min. Add garlic and lemon mix and add fish, tomatoes and peas to pan. Cook over med heat for 6-7 minutes or until the fish is cooked straight through.